It’s do-or-die time for the Winnipeg Jets. With six games left in the regular season, the Jets (39-25-12) are clinging to the final wild-card spot in the West at 90 points heading into action against the New York Rangers. The road to the post-season won’t be an easy one for the Jets down the stretch as four of their final six games will be against playoff-bound clubs. The L.A. Kings — just two points behind the Jets — have a much favourable schedule with two of their final six games coming against the Edmonton Oilers. The Kings also have games against the Avalanche and Sharks. This is why it’s do-or-die time for the Jets. There’s some more good news on the injury front for the Jets as No. 1 centre Bryan Little will make his return to the lineup. Little has been out of action since March 4 after suffering a lingering upper-body injury. 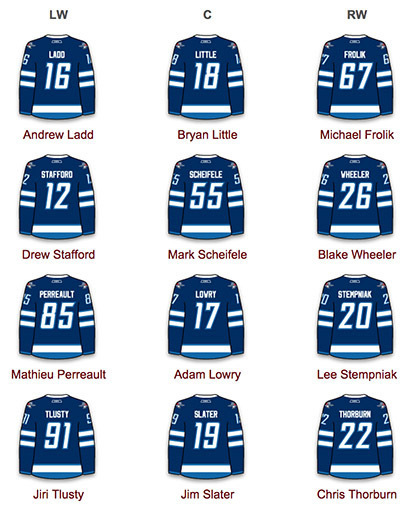 He’ll play between captain Andrew Ladd and Michael Frolik on the top line. Ladd still leads the team in scoring with 61 points. Blake Wheeler took over the team lead in goals with 25. Dustin Byfuglien hasn’t missed a beat since returning from a nine-game absence with an upper-body injury. Byfuglien has scored three goals in the last two games and leads all Jets blue-liners with 18 goals and 45 points. Ondrej Pavelec’s six-game winning streak came to an end in a 4-3 loss to the Chicago Blackhawks. 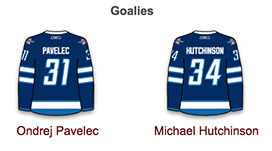 Pavelec is expected to get the call in net on Tuesday. He has a 6-4-1 career record against the Rangers. The Rangers (47-21-7) have already secured a playoff berth and are now looking to lock up the Metropolitan Division. With 101 points, the Rangers are six ahead of the second-place Pittsburgh Penguins for the division lead. Rick Nash has cooled off significantly in the month of March. Nash netted his 40th goal of the season against the Bruins on the weekend, but it was his only tally in the past 10 games. Nash’s 40 goals and 65 points rank first on the Rangers. The Rangers will get a boost on the blue-line with the return of Matt Hunwick, who missed one game with an upper-body injury. He’ll be paired with Keith Yandle. 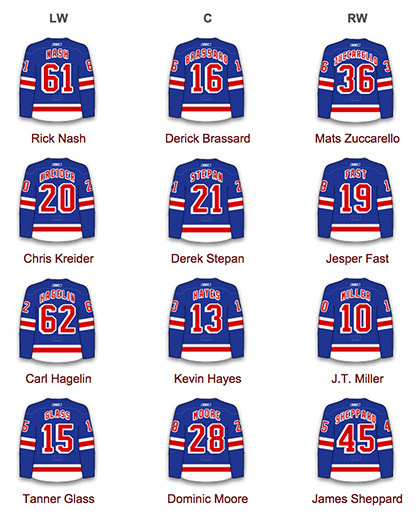 Henrik Lundqvist will make his second start since returning from a lengthy absence with a vascuar injury. The King is 25-12-3 and has a 2.29 goals against average this season. Game Day Predictions: The Jets will be idle for three days after their game against the Rangers. It’ll be the longest three games of their lives if they don’t win this one. Jets 4 Rangers 2. 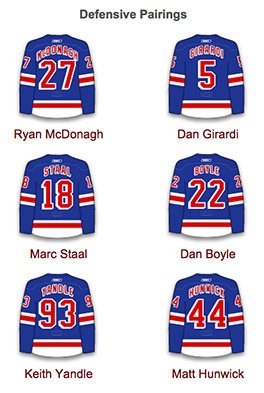 Obvious Predictions: The Rangers are a team that love to score goals. They rank sixth in the league in that department with 228 goals. Jets blue-liners will have to be aware of when to cheat, otherwise the speedy Ranger forwards (Yes Mats Zuccarello, I am pointing at you) will burn them. Not So Obvious Predictions: The Jets rank second in the league at 13.55 penalty minutes per game. But fear not, the Rangers have gone 2-for-33 on the man advantage over the last 15 games. 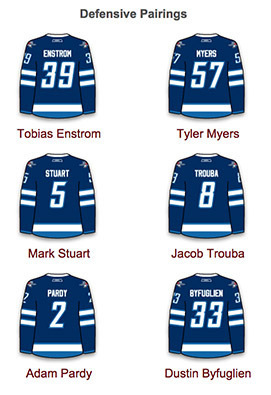 Nonetheless, the Jets will need to stay out of the sin bin. 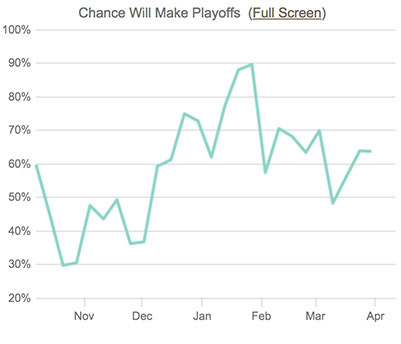 The Jets have a 63.7% chance of making the playoffs, according to clubsportsstats.com.